[150 Pages Report] MarketsandMarkets forecasts the global content delivery network market to grow from USD 6.05 Billion in 2016 to USD 30.89 Billion by 2022, at a Compound Annual Growth Rate (CAGR) of 32.8% during the forecast period. The year 2016 has been considered as the base year, while the forecast period is 2017–2022. This report aims to estimate the market size and growth potential of the content delivery network market across different segments, such as types, core solutions, adjacent services, service provider, organization sizes, verticals, and regions. The report aims to analyze each segment with respect to individual growth trends and contribution toward the overall market and to provide detailed information regarding the major factors (drivers, restraints, opportunities, and industry-specific challenges), which influence the growth of the market. The aim is to deliver competitive intelligence from market analysis and plan revenue growth strategies from the market size and forecast statistics. The prominent players in the content delivery network market are Akamai (US), Google (US), Level 3 Communications (US), Limelight Networks (US), Amazon Web Services (US), Internap (US), Verizon (US), CDNetworks (Korea), Tata Communications (India and Singapore), and StackPath (US). The key innovators identified are Cedexis (US), Imperva Incapsula (US), Fastly (US), CacheFly (US), and Cloudflare (US). With the given market data, MarketsandMarkets offers customizations as per the company’s specific needs. Also early buyers will receive 10% customization on the content delivery network market report or other related report. Under customization, further segmentation of regions into different countries can be provided. 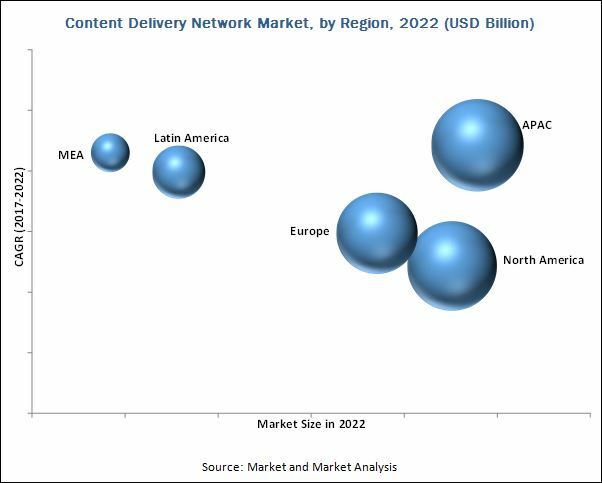 The global Content Delivery Network market is expected to grow from USD 7.47 Billion in 2017 to USD 30.89 Billion by 2022, at a Compound Annual Growth Rate (CAGR) of 32.8% during the forecast period. An increasing need for live and on-demand video delivery and loading is a major driver of the market growth. Offering best end-user experience, improved productivity, and lowering latency are also driving the global market. The report provides detailed insights into the global content delivery network market, which is segmented by type, core solution, adjacent service, service provider, organization size, vertical, and region. The type segment covers standard/ Non-video and video CDN. Video content delivery network is expected to hold a larger market share due to the increasing need to deliver rich media content and on-demand video to end users. Among core solutions, the media delivery solution is expected to hold the largest market share and is expected to continue its dominance during the forecast period. Media delivery with best quality experience and the lower delay time is very essential for content creators and organizations to offer the best viewing experience to end users. . Moreover, storage services will remain the most significant service contributing the highest revenue. Whereas, the traditional providers are expected to give the highest contribution to the overall content delivery network market. The traditional content delivery network providers offer solutions to deliver static, dynamic, and interactive contents to end users. This request is routed to nearest servers to users, and the content is then delivered to users by speeding up page loading in the maximum possible bandwidth. 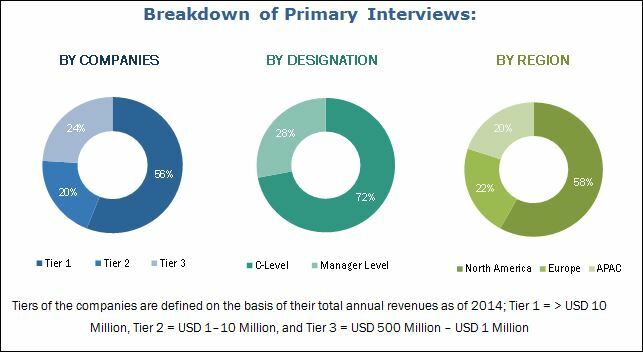 The report covers all the major aspects of the content delivery network market and provides an in-depth analysis for major regions including North America, Europe, Asia Pacific (APAC), Latin America, and the Middle East and Africa (MEA). North America is the major contributor to the global market due to its major acceptance of innovate technologies and early digital transformation across verticals. This region is expected to dominate the market in terms of market size during the forecast period. The APAC region is expected to grow at the highest CAGR during the forecast period, owing to the growing digitization across enterprises, and adoption of CDN solutions and services among major verticals. The APAC region is expected to grow significantly and will exceed other regions by 2022. This is owing to the growing digitization and commercialization in this region. Additionally, the need for content delivery solutions will increase to deliver video content to end users. The issues related to latency and website monetization are acting as restraining factors for the market growth. Monetization has given rise to several issues, such as slower page response, and it may also lead to an unbalanced load of webpages. The content delivery network market ecosystem comprises key vendors such as Akamai (US), Google (US), Level 3 Communications (US), and Limelight Networks (US), Amazon Web Services (US), Internap (US), Verizon (US), CDNetworks (Korea), Tata Communications (India and Singapore), and StackPath (US). The key innovators identified are Cedexis (US), Imperva Incapsula (US), Fastly (US), CacheFly (US), and Cloudflare (US). Other stakeholders of the content delivery network include CDN providers, network and system integrators, networking companies, CDN providers, data center providers, Cloud Service Providers (CSPs), Internet Service Providers (ISPs), telecom providers, Value-Added Resellers (VARs), Managed Service Providers (MSPs), and hosting vendors. *Details on Business Overview, Services Offered, Recent Developments, MnM View, Key Strategies, SWOT Analysis Might Not Be Captured in Case of Unlisted Companies.